When you are seeking a promotional gift; you want to invest in items that will survive rigors of daily use and amuse your customers every day. Why don’t you consider34 to 41.99 square inch custom die cut magnets 25 MIL? 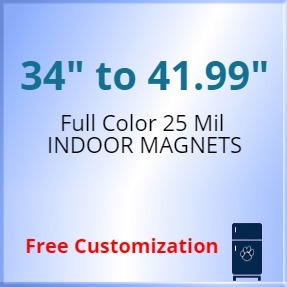 These promotional magnets will look pleasant everyday and continue to bring you great exposure. Your recipients and their friends will look at these promotional die cut magnets with admiration. Our free full color printing and free shipping will bring you great advantage. Additionally, you can save on typesetting assistance and digital design proofs, too. Order yours today! Request a quote to know savings that you can pocket on bulk ordering 34 to 41.99 square inch personalized die cut magnets 25 MIL. Product Weight: 8 lbs per 75-approx.